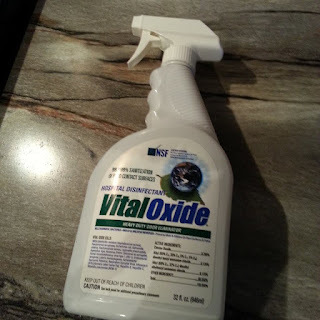 If you are a mom, like me and have seen your children EAT or PREPARE food right on your counter tops you know how important a product like Vital Oxide Disinfectant Cleaner can be. I have seen my kids make a sandwich where I had just prepared raw chicken the night before. Vital Oxide Disinfectant Cleaner is easy to use and removes and kills 99.999% bacteria and other harmful microbials that can come into contact with food. All you do is spray it on the surface and there is no need to rinse or wipe it away. This is a hospital grade sanitizer that not only kills germs but also removes odors. When used it leaves no sticky residue or scent behind. make sure to checkout the Vital Oxide Disinfectant Cleaner web page today to request your free sample and see how well it works for you and your family. It's Non-Toxic, Plant Based, Food Safe and also removes mold and mildew too. So you know this spray is safe for your family and pets with no harsh chemical smell. 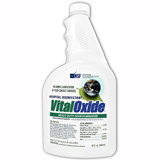 Vital Oxide Disinfectant sanitizes surfaces, killing 99.999% of bacteria and other harmful microbials. Also eliminates odors, mold and mildew on hard surfaces, carpets and fabrics. Apply Vital Oxide on food contact surfaces with no need to rinse or wipe, just allow to air dry for 10 minutes. Areas of use include: Home, vehicles, schools, day care, locker rooms, sports gear, hard wood floors, glazed ceramic, tile, fabrics, HVAC and Air Ducts. Vital Oxide is used against the Ebola virus.